All of the modules listed below in the Certificate Program in Children’s Grief and Bereavement can also be taken as individual workshops. 9 AM- 4 PM. See specific dates below. For more information or to register please visit the Sick Kids Centre for Community Mental Health site. The R. S. Kane Funeral Home is privileged to make available the Take Heart Bereavement Support Program. It is offered to our families and to the community at large, at no charge. The service is designed to help make the journey through grief a little easier. Each May, the Take Heart Bereavement offers a Kane Day Seminar, where the community has an opportunity to learn from experts in the field of grief and bereavement for FREE. This year the keynote presentation will be Andrea Warnick. This seminar is designed for: Physicians, Nurses, Social Workers, Counsellors, Educators, Psychologists, Hospice Personnel, Clergy, Chaplains, Lay Ministers and others caring for bereaved people. The death of a significant person can represent a powerful disruption in the emotional development of a young child or teen, however, many people receive little to no training on how to support grieving young people. This webinar draws on current literature and shares existing resources to provide parents, caregivers, professionals and volunteers with information and strategies to support grieving children and youth. Included in this presentation is a specific focus on the Children & Youth Grief Network’s new research project that explores the needs of marginalized youth who are grieving. This webinar is appropriate for anyone who may come into contact with a grieving child. Be that a parent, relative, professional, volunteer, etc. In this event you are welcome to ask your own questions or learn from the questions of others. 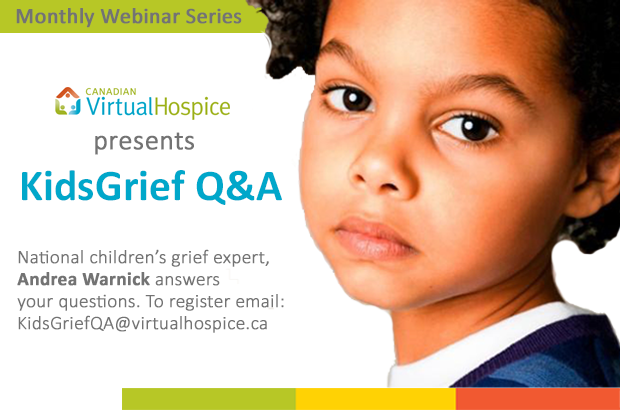 Register to participate in the live forum by emailing us at KidsGriefQA@virtualhospice.ca. You will receive an email a few days prior to the event with a link to access the forum. Click here for more information or to add this to your cart. Certificate of attendance for professional development available to the purchaser. The death of a significant person can represent a powerful disruption in all aspects of a child emotional existence. Yet few people receive any training on how to support children who are grieving a death, and as a result few parents/caregivers are provided with well-informed guidance in this area. The focus on this webinar delivered by Andrea Warnick is on supporting children under the age of 12 years old. This is an introductory level webinar designed for parents and other caregivers, however professionals and volunteers are welcome to attend as well. Play, creativity and the arts have a unique capacity to respond to human suffering, and to offer safe spaces for the exploration of ideas, feelings and questions around the experiences of death and grief. 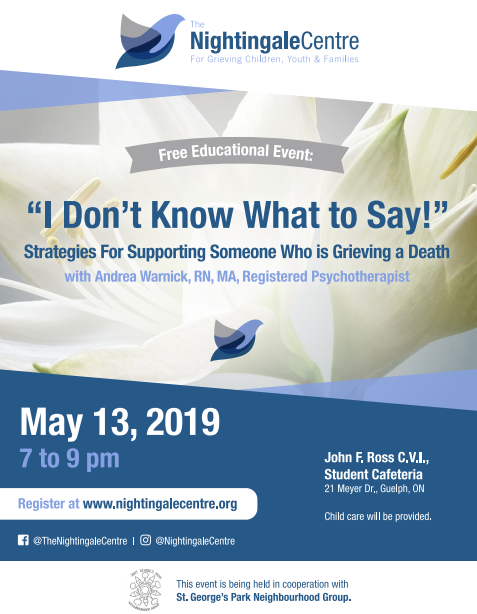 While Andrea will touch on the theoretical aspects of supporting children and youth who are grieving a death in this webinar, the emphasis will be placed on identifying play-based and other creative approaches to supporting children’s grief. This webinar is designed for parents and other relatives and caregivers, as well as volunteers and professionals who are looking to expand their toolbox and confidence in creatively engaging with grieving children and youth. With Andrea Warnick (RN, MA) and Michelle Methven. Click here for more information or to add this webinar to your cart. Michelle Methven’s daughter Stella Joy died from a brain tumor at the age of 3. The experience that Michelle and her family had with the funeral home who cared for Stella after her death inspired Michelle to become a funeral director herself, which she has since done. In this webinar we will share some of Stella’s story as well as practical strategies for supporting children through funerals and other ceremonies. 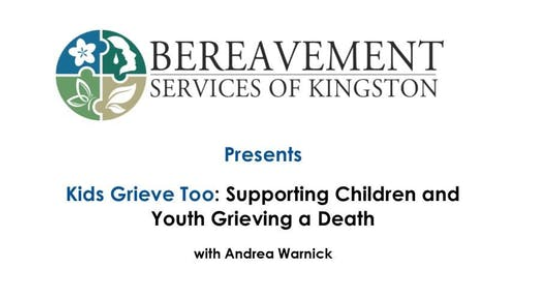 This webinar is designed for parents and other caregivers as well as funeral service workers, counsellors, health care providers, volunteers, and anyone else who is supporting a grieving child. Do you have a relative, friend, colleague, or acquaintance who has experienced the death of someone close to them? Despite having the best intentions, some people inadvertently say things that can create challenges for the grieving person. Sometimes people don’t say anything at all out of a fear of saying the wrong thing which can contribute to a sense of isolation for the griever. * Webinar Gift Certificates Available * Share with someone you care about. Gift certificates allow you to purchase access to both live and recorded webinars, so that support and information can be accessed when they are needed. Click for more information.